No place for a boat! I moved to north Texas just over four years ago. They tell me we are in a severe drought. I can only assume this is true because it began the year I arrived. This is my fifth summer in the land of dry. I drink a lot of water here. I remember my husband planning a drainage system when he built a new garage in 2011. It didn’t make any sense to me because I never saw any run-off. I listened, though, because he has lived here half his life. 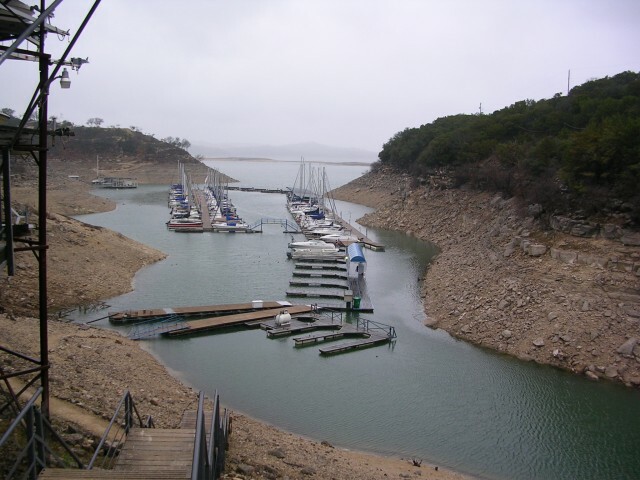 The cities have water restrictions based on how many feet the lakes drop from their normal levels. We can only sprinkle grass on certain days but they encourage us to water our houses several times a week. That is, the foundations need water. They crack anyway, as we discovered when we shopped for a new house to buy. It rains now and then but it is never enough for the thirsty ground. The water soaks into the dry clay, seeps into the deep cracks and gets sucked up by thirsty trees. There is no run-off to fill the lakes. After four years, going on five, some creatures have no knowledge of how to cope with water falling out of the sky. When it does rain, drivers forget to slow down, people forget to take umbrellas. Children don’t know much about the dangers of lightning or that mud is slick. Bewildered young animals don’t know where to find cover. Mr. Tom was born during the rainy season last year but I suppose his mother had some shelter. By the time he started wandering around on his own in June, the rain was over. This spring when we had some substantial rainfall, he yowled at the back door, which was funny because we never let him indoors. He finally figured out a cushion on the shelf of our patio kitchen cart was the best a cat could do, curled up and slept until it was over. Our little koi pond filled up but it is already down about six inches. The flowers bloomed but now they’re dormant again. In our short spring of about two weeks, my hair frizzed from the damp. Now it frizzes from the hot and humid Gulf wind. The grass grew so quickly, we’ve had to mow three times in four weeks. I think that’s just about over and we can put the lawn mower away until October. Moving here from the rainy Ouachita Mountains, Texas seems a dry and thirsty place. I’ve only been here four years, though. Maybe I’m like the young cat, assuming things and not planning for the gully washer that’s coming. I have to listen to long-time residents and assume they know what they’re talking about. They say it really does rain something fierce in north Texas. I wonder how much it will take to quench the thirst. This entry was posted in Short Takes on Life and tagged a dry and thirsty land, listen to the voice of experience, low lake levels in Texas, north Texas, Ouachita Mountains, shelter in the time of storm, Texas drought. Bookmark the permalink. thirst spreads as we have also been down in rainfall and moisture for several years. We are up for this month though. It has been nice for the water bill.